In conjunction with the 40th anniversary exhibition Days of Endless Time, the Hirshhorn is pleased to collaborate with Lapham’s Quarterly on its Fall 2014 issue, Time. The magazine, which serves as the companion publication to the Hirshhorn’s exhibition, includes a broad range of writing related to the focus of the exhibition, as well as images from many of the time-based installations on view at the Museum. Join us for an engaging conversation moderated by Lapham’s Quarterly founder and editor Lewis H. Lapham, who will be joined by Jay Griffiths, author of A Sideways Look at Time, and Jim Holt, author of Why Does the World Exist? : An Existential Detective Story. 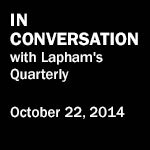 A Q&A session and signing with Lewis H. Lapham follow the conversation. Seating is limited and available on a first-come, first-served basis. Members at the Inner Circle level ($500) and above may reserve two seats per public program at the Museum. To check on the status of your membership or to RSVP, email hirshhornevents@si.edu or call 202.633.2836. Right: Lewis H. Lapham. Jay Griffiths. Jim Holt; photo: Roderick Aichinger. Days of Endless Time is organized by the Hirshhorn Museum and Sculpture Garden, Smithsonian Institution, Washington, DC. The exhibition is made possible in part by generous support from Janine and J. Tomilson Hill, Kitty and Tom Stoner, and Ginny Williams in honor of Kerry Brougher. Additional funding is provided by the Holenia Trust and Shinola Detroit.